‘God loves us and treasures us’ is Anna K Payne’s main message in this unique Bible Study Guide, which sets out to show the gentle and caring side of our Father. Those who have read the Planted Flowers books will recognize the quotations sprinkled throughout the book. They are from the six women in the series and illustrate how following the author’s program can radically change people. The study covers six months. Each weekly unit builds on the previous one, leading the participants in natural progression towards greater intimacy with God. Judging from the testaments at the front of the book, the format is very successful in planting the seeds of faith and making them grow. Participants learn to believe in God the Father’s unconditional love for them as individuals and the enormity of His Son’s sacrifice to redeem and save all of us. Group members become more confident Christians, while bonding with a newly formed and supportive network of people who care about them and will pray with them whenever the need arises. This guide understands that as we go about our daily lives, it’s important to have friends in Jesus to help us stay on track and walk the narrow path with joy. Each month has an overall theme, beginning with “Your Personal Relationship with God,” which explores where the participant is currently in her relationship with God, the nature of God and why He loves us. All themes are supported with paraphrased quotations from Scripture, which the author encourages the readers to look up for themselves in different Bible translations. Learning to hear God comes next, together with understanding the role of the Holy Spirit in helping us listen to Him and in teaching us how to pray. The author discusses the nature and purpose of suffering and how to trust God and allow Him to fill us with courage. She addresses the daunting issue of “The Enemy’s Plans and God’s Plans,” explaining how the Devil assails us daily but how to fight back with the help of spiritual gifts. Outlined are ways to find our spiritual gifts and use them to thwart Satan as he prowls around seeking our ruin. This progresses to finding our mission in life and how closely it is tied in with serving others, as Christ did. Once again, Ms. Payne gives concrete examples of how to do this. She also tackles the tricky subject of tithing and suggests a gentle way of easing into the practice for those who are not yet in the habit! In the final month, participants are encouraged to share their story. They are also made aware that they have a purpose in God and shown how to find it. Before parting at the end of the six month program, members of the group are encouraged to recognize where they were at the onset of their journey and where they are now in their relationship with God. This final session ends with a celebration of the progress each of them has made. Most Bible studies examine certain books of Scripture in depth but in an innovative way Anna K Payne starts instead with a premise: God loves us and treasures us. Supporting her themes with scriptural references, she takes the reader on a delightful journey from no relationship with God, or a poor one, to achieving closeness with Him. Every step of the way is mapped out with practical guidelines to help the members in the group achieve the peace that comes from fulfilling their purpose here on earth as a child of God. This Bible Study sees God from a loving perspective and will help Christians from all denominations on their walk with their Creator, especially if they regard Him at present as a distant figure. They will be pleasantly surprised to find out who God really is. Anna K Payne loves a mystery. Her favorite movies contain one-liners and things that explode. Her relationship with her Savior is her number one priority and her family comes second. But her passion and vision is to inspire hope, encourage others, love richly, and listen well through the strength of Jesus Christ. She seeks to do this through her devotionals and Christian suspense novels as well as aiding her family of writers publish their own books. Anna likes to study the art of writing, learning to edit her own work, and exploring the creation of an author platform. When she isn’t at the computer writing or editing she is discussing plots with any one of her children – including her talented son-in-law. She has been discovered asking the advice of her cats. “They have good ideas.” she says. The world around her offers a variety of sinister plots even if it is just someone waiting for the bus. Available in paperback for $11.66. Whether you are Catholic or non-Catholic, this book makes wonderful reading for anyone who has trouble with the concept of the Sacrament of Confession. Right at the beginning of the book, Dr. Scott Hahn gives the Scriptural foundation for it. Christ breathed on the apostles, and said to them, ‘Receive the Holy Spirit. If you forgive the sins of any, they are forgiven: if you retain the sins of any, they are retained.”’ (John 20:22-23). He has an answer for those who say that they can confess in private to God and not out loud to a priest. A look at the chapter headings will already give you the sense of compassion emanating from the Cardinal’s invitation to all of us to ask for God’s mercy with humility. Why Go to Confession? explains not only why God wishes us to go, but also the benefits we receive in the form of God’s forgiveness and how that positively impacts others around us. The chapter By What Authority quotes in Scripture where Jesus gave the apostles the authority to forgive sins, and how we have it on divine authority that our sins are forgiven. The Grace of Repentance and Conversion explains that feeling guilty is not our goal, but merely a symptom showing us which part of our lives we need to change. Once we recognize our sins we can be sorry for them and live a better, more peaceful life. Reading The Fruits of Confession it becomes clearer how healing it is to be able to talk to priest about our wrong doing, repent over it, and receive forgiveness. You might go into the confessional feeling bad, but you come out with a clean slate. You resolve not to sin again - not because you don’t want to have to confess the same sins again, but out of gratitude to God for His amazing forgiveness and a desire to please Him. Obstacles, Real and Imagined tackles all the excuses we come up with for not going to Confession and assures the reader that it’s never too late to return to the sacrament. Cardinal Wuerl even explains what to do if you have claustrophobia and can’t go into the confessional. For those who got yelled at the last time they went to Confession, Cardinal Wuerl also has helpful words of wisdom and encouragement. The book explains the Seal of the Confessional, and goes through the Rite for the Reconciliation of Individual Penitents for those who’ve been away for many years and cannot remember exactly how it goes. Throughout, the book is sprinkled with From the Pews stories of regular parishioners’ experiences of coming back to the sacrament. 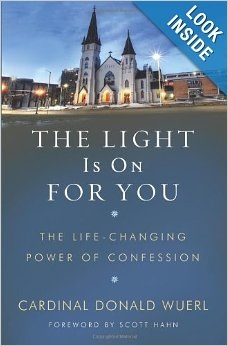 They help the reader feel less alone with his or her anxieties about going to Confession. This is a remarkable book, and especially worth reading as we are about to enter the forty days of Lent. If you’ve been away from the Sacrament of Confession, read The Light Is On For You and consider taking advantage of God’s loving forgiveness and receive Him in Communion this Easter. This little 70 page book with no cover is the most potent document I have ever read. Purgatory seems continually to go in and out of favor, but reading this has left me in no doubt as to its existence! One nun in Purgatory visits another, who is still on earth. The living nun's life in the convent was made very difficult by the deceased visitor. 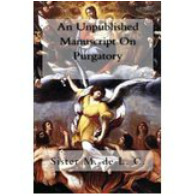 The latter explains the nature of Purgatory, how we on earth can help those souls who are expiating their sins in that dreadful place, and how we can avoid ending up there ourselves. An amazing manual on how to live a life pleasing to Christ, this book shows us how to become saints without having to perform great deeds. We are shown how to lead exemplary lifes in a quiet way, not drawing attention to ourselves or actively seeking praise from humans. God's approval is all we should look for. "Remain closely united to Jesus. Before every action, however trivial, or whatever you may have to do or say, ask His advice. Speak to Him heart to heart as to a friend whom one has always close at hand." This is a book which I shall read over and over again, taking heed of its easy to understand spiritual guidance.